for your PFC20X 20A or PFC30XM 30A input, 40A output DC EV lithium battery charger The J1772 port on the back of the chargers is now included on all chargers that ship (no extra cost). However, in order to use our chargers with the J1772 public EVSEs you do need a Manzanita Smart Box. We are still in BETA for this unit as the packaging design has not been completed and some of the features are still being hammered out. The remote current adjustment module is a new product that is still going through final R&D but it will allow a customer to have the charger in the trunk with an amps knob on their dash. The PFC-30 is designed for as much as 30 line amps and 40 output amps. Your charger will operate from any voltage from 60 to 240 volts AC at either 40 to 80 Hz. The PFC30XM 30A input, 40A output DC EV lithium battery chargers have a throttle knob to allow the user to turn the current down when using shared or undersized circuits. These PFC30XM 30A input, 40A output DC EV lithium battery chargers are designed to operate at full capacity from a 30 Amp circuit. Efficiency is 88% to 96% percent on the early PFC30XM 30A input, 40A output DC EV lithium battery charger units depending on input and output voltage. The later PFC30XM 30A input, 40A output DC EV lithium battery charger units operate quieter with a loss of efficiency when bucking. Power factor is .92 to .9997 and depends on input and output voltage. Low output voltage from high input voltage is the former. High output voltage from low input voltage for the latter for your PFC30XM 30A input, 40A output DC EV lithium battery charger. The PFC30XM 30A input, 40A output DC EV lithium battery charger is protected from reverse polarity installation by an internal fuse. Over temperature conditions cause the current to ramp back to prevent the internal temperature from going over 170F (more air makes more power) for your PFC30XM 30A input, 40A output DC EV lithium battery charger. The PFC30XM 30A input, 40A output DC EV lithium battery charger is programmed to be a constant current source and will survive a short circuit indefinitely. There is a programmable timer to shut off the PFC30XM 30A input, 40A output DC EV lithium battery charger after a user selectable period. This PFC30XM 30A input, 40A output DC EV lithium battery charger is non-isolated. The negative terminal of the battery is connected to the negative terminal of a rectifier bridge with the AC terminals connected to the incoming line. 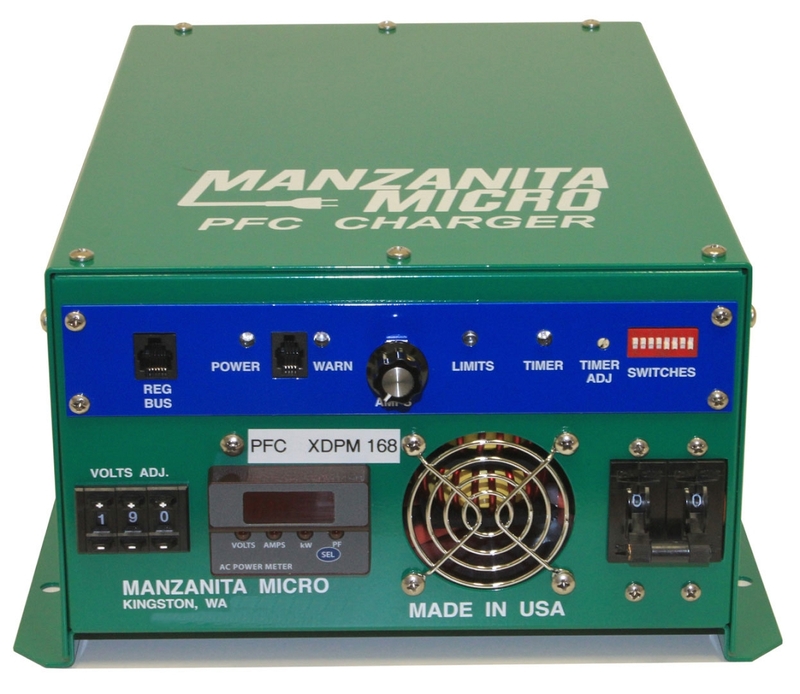 The Manzanita Micro PFC20X, PFC30XMM and PFC40XM chargers have the same size enclosure. With a fully adjustable output voltage for battery packs from 12 to 450VDC and power levels of up to 9.6kW we think you'll agree that there are no other PFC30XM 30A input, 40A output DC EV lithium battery chargers that are this flexible or powerful in such a small footprint. There are no input voltage settings to change for your PFC30XM 30A input, 40A output DC EV lithium battery charger, simply plug into any AC wall outlet from 100 to 250 volts and 40 to 80 hertz. The current is easily adjustable on your PFC30XM, allowing users to fine tune the unit to pull the maximum amount of amps from whatever outlet is available. All PFC40XM chargers come standard with built-in digital Input Amp Meters (ammeters) allowing quick and precise amperage adjustments. The small size, flexible input and output ranges and ease of user adjustable features make Manzanita Micro PFC30XM 30A input, 40A output DC EV lithium battery chargers an exceptional on-board charging solution so your electric vehicle should never encounter a single phase outlet it cannot use. The 20, 30 or 40 terminology is symbolic of how many amps that charger is rated to draw from the AC line. Unlike some other chargers, this is the rated continuous load and all PFC30XM 30A input, 40A output DC EV lithium battery charger units are thoroughly tested to their rated limits before leaving Manzanita Micro. PFC30XM 30A input, 40A output DC EV lithium battery chargers can be set up to accept SAE J1772 communication. All PPFC40XM chargers are buck enhanced so a PFC30XM is capable of moving up to 40A into a low voltage pack but a PFC-40 is better for H.V. packs. 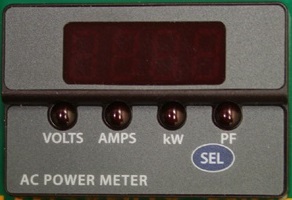 Maximum power levels are 4.8kW, 7.2kW and 9.6kW for PFC20X, PFC30XM and PFC40XM respectively. It is no wonder Manzanita Micro PFC30XM 30A input, 40A output DC EV lithium battery chargers are used in electric vehicles in countries all across the globe. There are 2 ways to get an exact quote for the base shipping for your PFC30XM 30A Input, 40A Output DC EV Lithium Battery Charger order. We’ll research the exact shipping cost and send you an invoice to your PayPal or email or you can add it to your pallet in $1 Shipping Increments for your PFC30XM 30A Input, 40A Output DC EV Lithium Battery Charger order.